Another hand cream review today! I can't get enough of them, obviously! 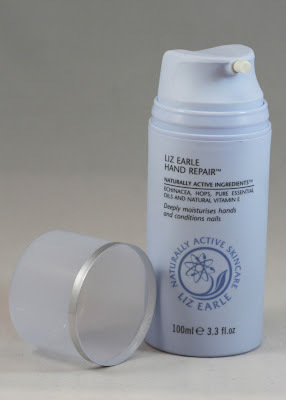 Today it's Liz Earle's Hand Repair hand cream. I've become a huge Liz Earle fan recently - you may have seen my skin care, make up or nail polish reviews recently - both the skin care and make up have become part of my daily routine and I'm not sure how I managed before them. So I was keen to try out this hand cream, like I've said before, I'm always on the look out for decent hand creams because my hands suffer so much from all the acetone I use on my nails, but also this cold weather and warm heating don't do the dryness of my skin any good. The hand cream comes in a little pump bottle (similar to the pump bottle for the Hot Cloth Cleanser, if you've seen that) which means dispensing the cream is nice and easy - though I think if you do a whole pump, it dispenses far too much, so watch out for that. It is a lovely silky smooth cream which rubs in really easily. It's a little on the greasy side for my liking - I'm aware of it being on my skin for a little while after, which when I'm using my iPad and iPhone as much as I am, is a bit annoying. When I put it on at night, the next morning my hands are super smooth and feel really replenished. It has an interesting fragrance - on the back it says it contains bergamot, chamomile, neroli and lavender - so I suppose that's what it smells of! I think until this moment when I read that, it was the chamomile I couldn't put my finger on - I'm not a chamomile tea drinker because I don't like the smell of it so much, so I think that's what makes me less taken with this hand cream than other hand creams I've used. It is very moisturising and I really like the feel of how silky it is - so it's the sort of hand cream I'll keep by my bed and use before I go to sleep so I don't notice the fragrance or the slight greasiness.